I originally entered the "dog world" as a trainer. Since childhood I had watched Schutzhund competitions, both in Germany and the USA, on a regular basis. Occasionally I was allowed to practice with some of the trained dogs, always yearning to start my own program! In 1962 I did just that. Because I liked the heavier bone on some of the American dogs, I chose to train this big & beautiful variety, instead of imports. Not only were these dogs *big*, they were extremely intelligent, and very willing to please! The Deininghauserheide line produced many dogs with excellent prey drive, but it was the Liebestraum line that carried the gene (intelligence) I wanted! Osnabruckerland added the size I was striving for, and of course honorable mention must go to the Piastendamm line that gave these dogs the courage and "heart" so vitally needed for a successful training program. Although I spent most of my time training, I also had put effort into producing puppies that would be suitable for my program. So many people were impressed with my training techniques that my list of clients was growing very quickly. Therefore I needed to raise up puppies to meet this demand. Even though I was still young, I had the advantage of working with some of Germany's greatest trainers. I felt there would be no stopping me. Then I started to experience the heartache of CANINE HIP DYSPLASIA. After spending nearly one year of my time raising & training a puppy for someone, he would start limping. This meant we had to slow down the training procedures, (aside from travel time to and from group sessions, each puppy needed at least 2-3 hrs per day of active training/socialization in order to reach his/her potential) like missing school, the young dog would start to fall behind. In order to determine if "Pano" or "CHD" caused the problem, it was common practice to x-ray the dogs at about 1 year of age. Many dogs had to be eliminated from the program due to bad hips. This was becoming a serious "set-back" to my goals! I started doing some heavy research into the problem. I discovered that in 1966, the Orthopedic Foundation of Animals (OFA) was formed to help solve the horrors of CHD! Great! The GSDCA was urging all breeders to OFA their stock before breeding, so the problem of CHD would be totally eliminated. Yes! In 1968, the SV (in Germany) also established a program, going one step further. German dogs that did not have an "a" stamp could not even be shown at the Seiger shows. All dogs had to be tattooed at the time of x-ray, and all films had to be submitted to the SV. If an animal with severe hip dysplasia were discovered, his/her name would be published in the Zeitung, with a notice that his/her progeny would not be registered! Everyone felt that it would only be a matter of a few years, and CHD would be totally eradicated from our beloved dogs. Unfortunately, things didn't go quite like planned. Many study groups were being formed dedicated to finding the answer so this nightmare could end. It was thought that CHD was transmitted by a dominant group of genes with irregular manifestations. Breeders were told that it could be just an "environmental" problem. By allowing puppies to get too fat, or slip around on floors, etc., the breeder was really "causing" the problem. Dr. Bardens devised a method of palpation that was capable of detecting dysplastic pups at 7 weeks of age, with an 85% accuracy. Some breeders even went to the extreme of having a pectinotomy performed on their puppies in order to eliminate the potential (future) development of CHD. Although some people went to various extremes, Dr. Bardens "wedge" technique was a great breakthrough in determining potential dysplasticity. Despite all of these new discoveries and dedicated research advancements, CHD still remained an admirable foe! It was soon realized that due to the polygenic mode of inheritance, parental x-rays would not solve the dilemma. Breeders would need to look for other solutions! Like what? If OFA parents were still producing dysplastic puppies, how far back in the pedigree did a breeder have to go before the problem was eradicated? It wasn't long before breeders started to advertise "3, 4, 5, " generations of OFA stock. Yet the problem still continued. Although by breeding several generations of OFA (good or excellent) dogs, the percentages were lowered, nevertheless, CHD had refused to release its strong grip! Common ancestors in the first 4 generations. 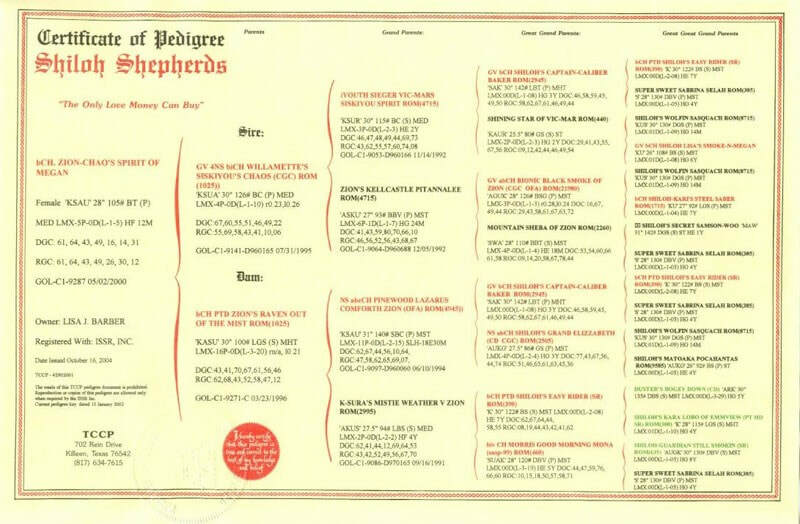 Hip ratings (including the "a" stamp) on as many dogs (of the 30 dogs) in the first 4 generations of their pedigree. We then divided these dogs into the percentages of dogs x-rayed. E.g. 10%(3 dogs), 30% (10dogs), 50%(15 dogs), etc. Look for common denominators between those with good… and those with bad hips. E.g. size, coat (we were clearly noticing that the "long coats" had better hips), nutrition, stress, etc. Researching for an "environmental" key to this puzzle. Comparisons of littermates in order to "track down" the stronger lines. E.g. If a litter of 10 puppies had only 1 with bad hips, while another litter of 10 puppies had 7 bad hips, it was an indicator of the parents (pedigree) strengths/weaknesses. As the data was being compiled we noticed two things: 1) The "long coated" dogs had an extremely lower incidence of CHD. 2.) When dogs with a high percentage of OFA littermates were bred, the offspring had much better hips! A genetic 'blue print" was beginning to emerge! If we started to apply the information we had accumulated, into our future breedings, would we be able to significantly improve our chances for good hips! This would be no easy task because breeders would be required to provide us with honest information regarding the puppies they produced. Other breeders that were competing for puppy sales, not to mention, the potential for various other repercussions could use such data against them! Without sincere cooperation from the breeders, so that we could continue to document hundreds of litters, this new "program" was doomed to fail. Then, right in the middle of this controversy, the GSDCA made an announcement that would turn everyone's world upside down, especially mine! "The parent club would like to point out that with such a small number of dogs certified, there is a real danger in overemphasizing hips in one's breeding program. Sound hips are far from being the only consideration in breeding. The German Shepherd Dog must be regarded as a complete entity--a working dog, uniquely gifted in intelligence, beauty, and utility. The breeder should not be swayed by the current emphasis on hips, to lose sight of the various attributes indispensable to the German Shepherd Dog; i.e. Sound Character--stability, intellect, and trainability; Correct Structure--balance, harmony, and proper proportion; Gait--ease and efficiency of movement, stamina, and natural trotting ability; Quality- the reflection of nobility, strength and beauty. An exclusive concentration on any one facet may achieve its effect at the expense of some other attributes". During the early 70's I worked very closely with my local clubs, but by the late 70's I was writing articles for many of the Breed newsletters and other publications. Many of these articles will be reprinted on my Web Site. I feel they are just as pertinent now for the continuing future betterment of the Shiloh Shepherd™, as they were 20 years ago! If anyone is looking for a much "deeper" study into Genetics, please read "Practical genetics". Although I tried to explain the principles behind the LMX program, in "lay" terms, much of it was very difficult for the basic novice to assimilate. Therefore I will try to be less complex in the following brief overview of what the LMX program really means to our breed. With this in mind, let's just focus on one factor that was very prevalent in my breeding program; coats. Although I continued to prefer the smooth coats, due to the fact that they needed much less maintenance, I was still finding a lot of "long coats" in my whelping box. I was determined to find a good explanation for this phenomenon! During our research we had documented coat factors, and it was becoming very clear that most of my lines had a strong "long coat" Genotype! Whenever I bred dogs (smooth coated) that had longhaired LITTERMATES, I was finding many long coated pups in my litters. When I bred dogs that did not have "longhaired" littermates, I was usually getting full litters of smooth coats. When I bred dogs that did not have any "longhaired" littermates for 3-4 generations, all the pups were always smooth coated! Could this same formula work for eliminating bad hips?If a breeder could eliminate the "longhaired" gene by only breeding dogs that had nolonghaired littermates, in order to get all smooth coated puppies, then if we bred dogs with no dysplastic littermates, we could set the hip quality in our breeding program! I even went one step further in order to test Homozygosity (raised through heavy line/inbreeding making the individual "prepotent"), by breeding such dogs with those that had dysplastic littermates, and then documenting the results. The program was working! In 1978 I moved my family to a huge farm (with no neighbors) in order to put my theories into full research mode. I housed over 100 dogs, and with the help of my "satellite" breeders, we were able to produce dozens of litters yearly. Through these intense efforts, concentrating on littermate information in order to complete the genetic picture of various lines, we were able to reduce the incidence of CHD drastically! Full details, with pictures, are available on this site. Most people have a tendency to focus on the individual dogs they breed, without much regard to their littermates! Some breeders research the "Champions" in their pedigree, but ignore all of the other "untitled" dogs (as well as their littermates) because no data has been accumulated on them, other then name and (possible) color. This leaves a lot of "holes" that will inevitable produce a lot of "surprises" in the whelping box! I have always taught that, unless a breeder fully understands the "shadow" dog behind every name in their pedigree, they can not expect to breed with any kind of "predictability". If you make friends with "the shadow", you will be greatly rewarded in the progeny you produce! If you chose to ignore "the shadow" you are doing an injustice to your breed! Always try to remember that every dog you can "see" (phenotype), has a "shadow" that you can not"see (genotype), but you will certainly "get" a good look at it, in the puppies you produce! Isn't it better to get to "know" your shadow dogs before you produce undesirable traits in your puppies? Shiloh Shepherd™ (Kennels) has been documenting "Litter Mate X-rays" as well as other vital information since 1962. Many GSD lines were rejected due to the high incidence of CHD produced, even among those with many OFA ancestors. For over 3 decades the emphasis had always been placed on sound hips, large size, and stable temperament! Although other criterion was also documented, not much detail was placed on "show" faults. Since the breed has entered the Rare Breed world, a computer system was designed that would also track Dominant & Recessive Faults and Virtues, allowing future breeders to get a good "glimpse" at the shadow dog in their pedigrees. This program is called LMI (Litter Mate Information) and is only an extension to the original LMX program that has been so instrumental in reducing hip dysplasia in the Shiloh Shepherd™ dog. A litter only had 3 pups, even if all of them had good hips, there could have been some dysplastic pups, if 10 had been born. Or if the litter had been repeated, with 12 pups born, several of those could have developed bad hips. Therefore, whenever we have insufficient data on any particular litter, we must use caution! In cases such as these, research into their (the parents of the 3 pups) littermates, and the progeny they produced could be very helpful! Especially if "reverse" (Sire's sister bred to Dam's brother, etc.) breeding formula's were used. Research into sibling breedings is always recommended, in order for a breeder to get a "better" look at the shadow dogs in their particular line! Intense research into the siblings, as well as ancestors, at least 4 generations back (preferable 7), is the only way for a breeder to get a complete picture of the various genes he/she is dealing with. Often poor quality x-rays are sent to the OFA, thereby having to be classified as "moderately" dysplastic. This adverse information can lead breeders to forfeit some outstanding breedings. Our dogs have a tendency toward mild subluxation at a young age. If this dog is re x-rayed a year later, by a more proficient clinic, he may very well receive a good OFA rating! Recent research with PennHip has proven this to be a fact. Many dogs that have been rejected by OFA standards have received good ratings with this new system. I would like to suggest that owners use both methods. Since the PennHip system requires that an "extended" (OFA) view be done, as well as the DI views, it is very convenient to have your vet send a copy of the extended view to OFA, when he sends the other copies to PennHIP. By utilizing this "double format" you will be able to get a better understanding of your dogs true hip quality. Since PennHip has very rigid requirements that a vet must pass in order to get certified, it will also insure you of a "cleaner" x-ray for the OFA evaluation. (There can be Vet error, find a qualified Vet.). This will prevent potentially good dogs from being eliminated from breeding, too quickly! The most devastating problem that all breeders encounter (sooner or later) is created by the people that purchase their puppies! Unless a dog is showing signs of discomfort, owners have a tendency not to "bother" having them x-rayed! Many do not like to have their dogs "put under" anesthetic, for fear of possible side affects. While others just can not comprehend the necessity for x-raying a perfectly healthy companion. In most cases these dogs do have good hips, but without documentation of that fact, they leave a lot of "holes" in the LMX of their littermates! It is not a breeder's responsibility to "guess" at what the results "should" be. Without accurate data, many excellent dogs may end up "falling by the wayside". Conversely in some cases dogs that should not be used, will be added to the breeding program, due to a breeders poor "guessing" ability. In conclusion, I hope I have been able to present the urgent necessity of cooperation needed by both the breeders & owners, in order for the LMX program to operate properly. It has been proven time & again that the program will work! Various environmental factors can leave some cracks in the system, but LMX is still the answer to awesome hips. Now all we need is for all of the Breeders, Owners, and Fanciers that love this breed, to work together! In November 2003 the OFA published "Collecting and Utlitzing Phenotypic Data To Minimize Disease: A Breeder's Practical Guide" by Rhonda Hovan, encouraging the use of vertical pedigrees. For the first time, they are also linking littermates to an individual dog in their disease databases. In 1998 the SV started the Breed Value program as a method of lowering the incidence of hip dysplasia. For additional information, please read Mr. Fred Lanting's article, Breed Value and the GSD: The SV Zuchtwert Programme. Both of these efforts are similar to Tina M. Barber's Littermate X-Ray program, which she developed in the later 1970's through the early 1980's. In 1990 the ISSR was formed in order to continue documenting ALL LMX data on every Shiloh Shepherd born!! We know that this system works because our data has been proving it as well as all of the owners who keep bragging about their dogs on our huge (nearly 3000 member) forum!! Go ahead and use our "find" feature (just like Google) to locate all of the hip posts our members have shared! !